It’s all turkey talk when it comes to Thanksgiving. But really – it’s the side dishes that everyone stresses about, right? What to serve with the turkey. Back in the day my Mom served the same menu every year: candied sweet potatoes (fabulous but with more sugar than I can even imagine using now! ); baked cranberries (spiked with brandy); a green vegetable of some sort; her famous “filling” made with barley-shaped pasta, mushrooms, onions and celery. I like to mix it up every year, although I stick to tradition too. So we always have some sort of sweet potato dish (sometimes – yes --- with marshmallow, sometimes not); the same baked cranberries my Mom made; lots of vegetables; and stuffing (the kids got tired of Nana’s “filling”). We also have a vegetarian entrée, usually mujadarah or koshary. And I must be aware of allergies, so, no nuts in the stuffing, plus I try to make an additional vegetarian stuffing. 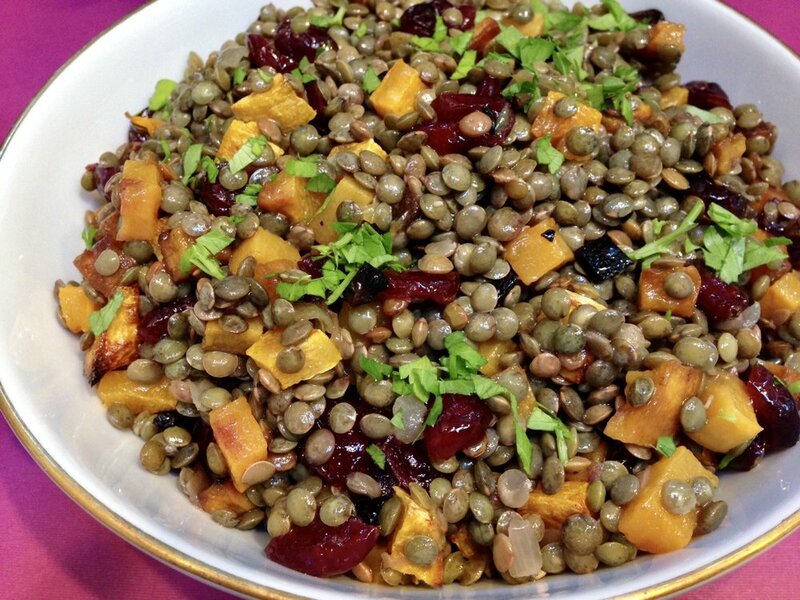 This year I am serving this lentil side dish also. It’s sort of like a salad but also like a casserole. And it can be made ahead. It’s a beautiful dish, filled with colorful, seasonal ingredients. It’s vegetarian. It’s a side-dish. It’s nut-free. Preheat the oven to 425 degrees. Place the squash and shallot on a parchment-lined baking sheet. Pour one tablespoon of the olive oil over the vegetables, toss and bake for about 20 minutes, tossing the vegetables occasionally. Remove the vegetables from the oven and set aside. While the vegetables are roasting, place the lentils and water in a large saucepan over medium heat. Bring the liquid to a boil, turn the heat to medium-low and cook uncovered for about 20 minutes or until the lentils are tender. Drain the lentils and place them in a bowl. Stir in the vegetables, cranberries and parsley. Pour in the remaining 2 tablespoons olive oil and toss the ingredients. Add orange juice, season to taste with salt and pepper and toss the ingredients. Add more orange juice if needed for moisture.